While the .22 long rifle is perhaps one of the most versatile rounds to ever be produced since its introduction back in 1887, it lacks the power necessary to excel in self defense applications. 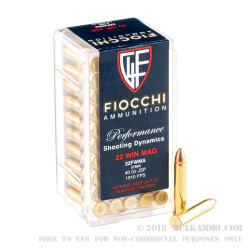 The Fiocchi 40gr .22 Winchester Magnum Rifle Jacketed Soft Point seeks to change that paradigm by producing one of the most lethal .22 caliber bullets to date. 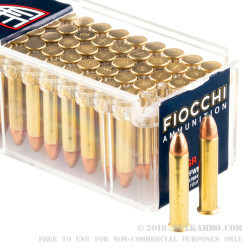 The Fiocchi 40gr .22 Winchester Magnum Rifle Jacket Soft Point houses a .22 caliber bullet in a rimfire cartridge that is 11.2 millimeters larger that your standard .22 long rifle round. This translates to more power and greater velocity than any standard .22 long rifle round on the market. Featuring a jacketed soft point bullet, the round is capable of expanding up to twice its diameter in size upon impact, and a velocity of 1,910 feet per second, .22 WMR bullet velocities are even higher than that of +p+ 9mm ammunition. 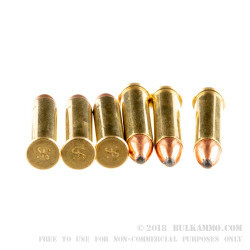 Ideal for handguns such as Kel-Tec PMR 30, this is a .22 caliber round that gives you all of the benefits of standard .22 ammunition, with none of the drawbacks. 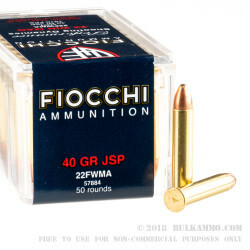 If you are looking for a self defense round that has the accuracy and light recoil of a .22, with all the stopping power of larger handgun caliber bullets, than the Fiocchi 40gr .22 WMR JSP is a dream come true.